Potty training. It’s an important development milestone in a child’s life. It can also be a very stressful period. Understandably, parents focus on pre-preparing with all the right essentials to ensure as smooth a transition as possible. Unfortunately, many don’t make use of Huggies® Pull-Ups® training pants. Why? It’s mainly due to a perception problem. "Parents see training pants as an overpriced and unnecessary solution – they think nappies and potties are enough." They think it’s enough to go ‘cold turkey’ and use nappies to keep children comfortably accident-free. But this approach generally proves more difficult and can hurt their confidence as they don’t learn on their own. 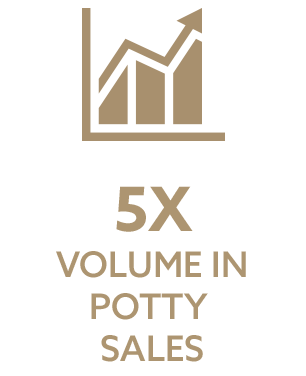 Complicating matters further, was the lack of visibility in-store for the potty training sub-category. Faced with a main competitor that was dominating shelves, and stuck in an aisle full of nappies and wipes, space is a premium for Pull-Ups®. So, we needed to reshape potty training in the shopper setting, whilst educating parents that Huggies® Pull-Ups® is the right product for them. Our solution needed to be simple in execution but high in effectiveness. Our idea was born from the understanding that baby events are hugely successful in driving incremental value by siting a number of products together from across different categories. This mechanic aids simple choice navigation between offers, with minimal consideration to enable quick and easy purchase decisions around multiple stock-up items for shoppers. opportunity to position Huggies® Pull-Ups® as a core essential, among more potty training items. Considering ASDA’s position as a go-to, one-stop family shopping destination, in addition to their priority focus on offering shoppers innovation and brand exclusives, joining forces with them made perfect business sense. Working closely with brand and category teams, we zeroed in on the best opportunity areas. 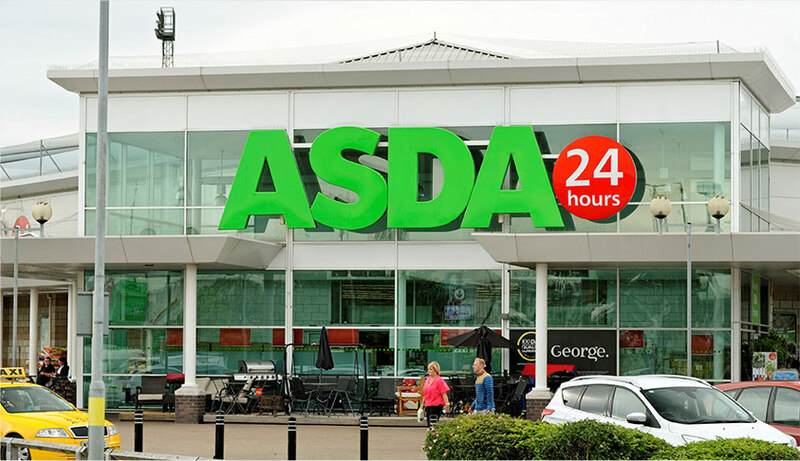 This led us to event gondola ends, a new initiative that let us maximise our potential, gain premium visibility out of aisle and proved to ASDA that we were committed to being leaders in our category. 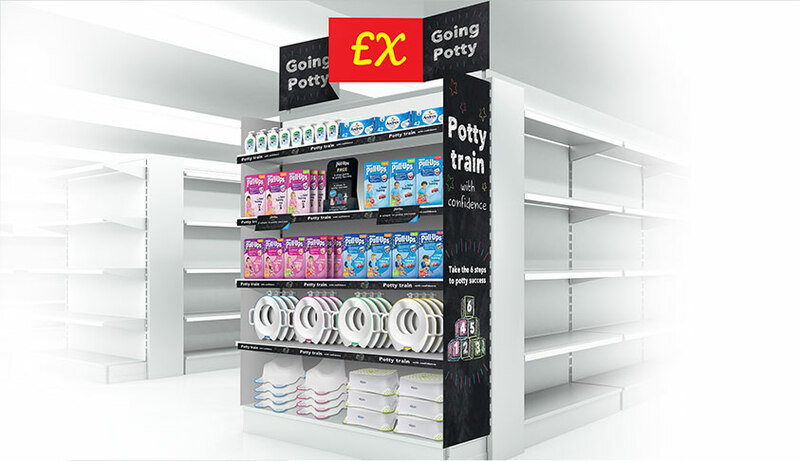 We sold the idea by showcasing how Pull-Ups® added value to the category by keeping shoppers engaged for longer, transitioning them through nappies into childcare. 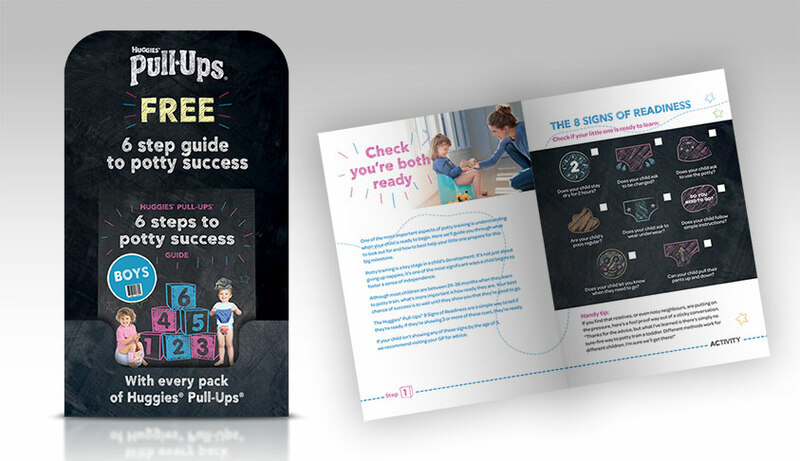 We leveraged our core product benefits to define the role of the product in supporting parents through potty training, supplemented by our 6 Steps to Potty Success training guide, which resulted in us securing a fully branded execution in-store. The campaign was so successful, it secured another gondola end placement for Pull-Ups® and two further event gondola ends for the remaining Huggies® childcare brands in 2017. Our fruitful partnership has also led to permanent categorisation opportunities within baby care, across the Huggies® portfolio. Talk about long term impact!